amid all the generated noise surrounding pseudo global warming, the economic turmoil and subsequent government fascistic intervention (look up fascism in a reputable, non-politicized source), there is good news that gets out there but is buried under the smelly pile of crap the news dudes are trying to feed us. how about good news for a change? how about if medical researchers are creeping up on a cure for alzheimer's disease, one of the most devastating and insidious diseases suffered by modern man? really good news that provides at least a glimmer of hope for the future. Yes, this is a cover of Mulatu Astatqe's "A Man Of Experience And Wisdom" which is an excellent tune captured on an excellent album (part of an Ethiopian music sampler series) Ethiopiques Vol. 4. I really dig tunes like this that are 30+ years old. Now we have a Cambodian band covering Ethiopian music which is really a trip because the music of Mr. Astatqe is based on his Ethiopian roots blended with his musical knowledge based on Western music schools. He was kind of the reverse of a lot of the American jazz artists (D. Byrd, J. Coltrane, H. Hancock etc) who were getting AFRICAN rythms into their music. So this tune went from a Western influence to Africa to Cambodia... and nobody got hurt. What a wonderful world. As you can read from the comment,there is blending of music from around the world that i think can only improve the overall quality/variety of music we all listen to. i find this happening in the food world too. i am a big fan of taking elements from many cuisines to make something entirely new, intriguingly flavorful, and wonderfully surprising. some internationalism, in the case of music and food, i can get behind! i remember thinking as a kid that the best jobs in the world were doctors and lawyers. i caddied at the local country club during the summer, and those dudes were out every Wednesday, playing golf instead of working. as a seasoned adult, i still have to work during Wednesdays because i chose to play with nuclear reactors rather than be a doctor, but i get to play at the range on the way home from work. i've been practicing a lot on the 50 yard range lately, and it is amazing how rapidly the skills needed to shoot that distance off hand have developed. 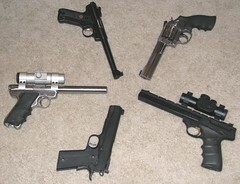 it helps if you have pistols capable of shooting very small groups at 50 yards, and these .22s fit the bill. a coworker tried talking me into something this morning, and upon discussion, stated "i spoke too soon". to which i replied..."so is that a case of premature expostulation?" i have a small herb garden. well, planter box if you really want to know. and the basil is starting to flower, so it's no longer a choice whether i want to use it or not. now it's use it or lose it! so what the heck do you do with a couple of big handfuls of basil? around here, that's an invitation to scour the pantry and cook up something interesting. 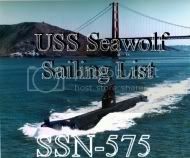 the pictures are links back to flickr for additional sizes. i'm not too sure why the pictures came out so dark, but there you are. a photographer i'm not. ingredients: your mileage may vary depending on what you have available. the beauty of these dishes rests in whipping up something good from what's available. throw it all in the food processor and blend. 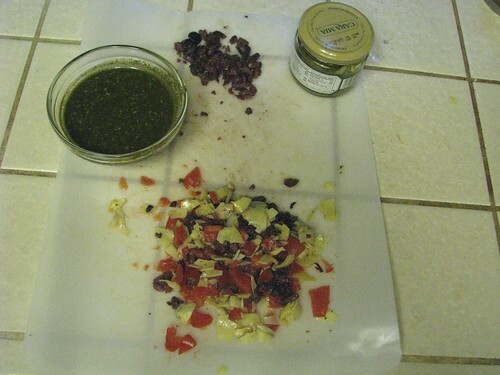 use enough oil to make a medium body sauce. small jar marinated artichoke hearts, chopped medium. i really really like Cara Mia marinaded hearts. use ones you like, especially if you have them in your pantry/fridge. 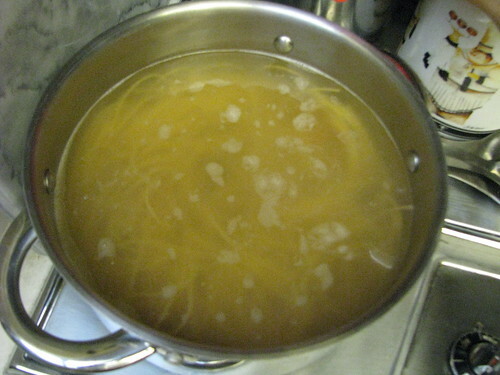 get the water on the stove to boil the pasta. cook pasta per package directions. while the water is coming up to temperature, assemble and chop/buzz/saute all the other stuff. everything should be done about the same time as the pasta is. pick and buzz the basil condiment. makes the kitchen smell like heaven, and you should take a moment to just enjoy the aroma coming from the basil and garlic. if you have pesto, use it by all means, or if you want to add the pine nuts to make pesto out of this concoction, feel free. i probably would have had i stocked pine nuts ahead of time. 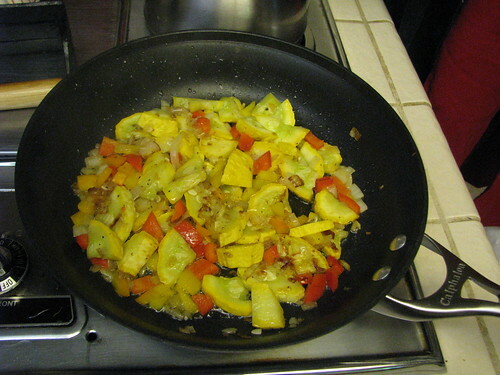 Saute (medium heat) onion, squash, and peppers until soft. kick the heat up during the last couple of minutes to get a little caramelization action going on the veggies. 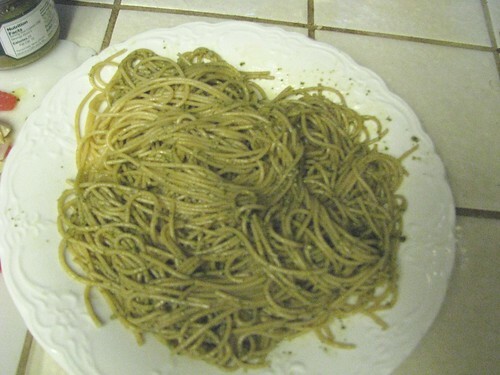 then spoon on as much or as little of the basil sauce as you like, and toss the pasta with tongs to distribute. 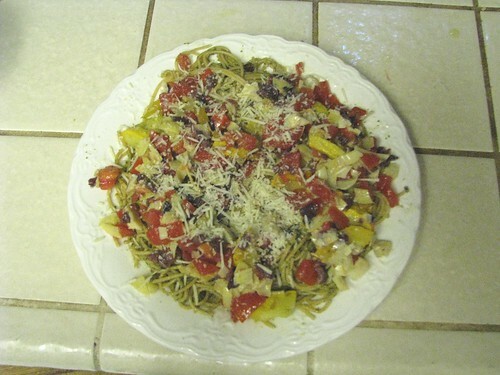 next, top with the condiments, add a little parmesan cheese on top, and serve. Enjoy! 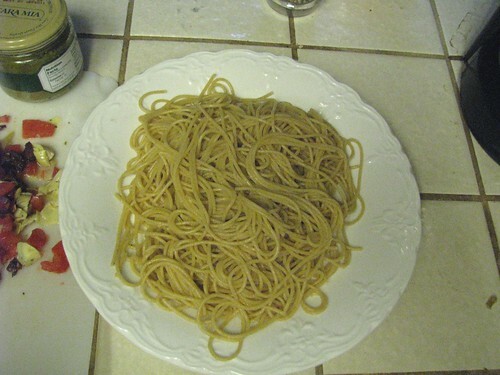 this took as long as the water needed to boil, and the pasta to cook. great meal, from things in the pantry, fridge, and herb garden. 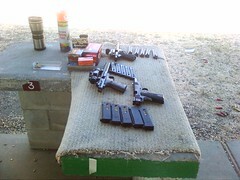 went to the range this morning with a case full of .22s this is an old picture, pre-mods on the MKIII, but you get the idea. i was shooting a 4 inch steel plate on the 50 yard range. shooter to the left: "damn, where did you learn to shoot. i'd take you into the sh*t storm any day". shooter to the right a while later: "holy crap. you can really shoot those pistols off hand"
it's the little things that keep me going back and practicing. hope you are all having a great weekend. lunch at the Cliff House tomorrow to celebrate dwardo, his lovely wife, my wife, and my July birthdays. looking forward to it.